FIBC is a container bag in large dimensions for storing and transporting various products which form is granular, powder, or flakes for example cement, sand, fertilizers, plastic resin and so on. 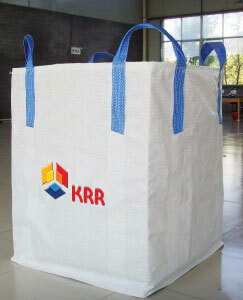 It is made of woven polypropylene and normally have customable size depends on the kind of product will be filled into. Its capacity is normally 500 kg – 2.000 kg and can be more. Transporting and loading is done on either pallets or by lifting it in loops. Bags are made with either one loop or four lifting loops. Emptying is made easy by a special opening in the bottom or by simply cutting it open. We can put a tube liner made of LDPE inside to protect the product from humidity and also we can add more protection by coating the fabric using PP Lamination. At first the FIBC as we know it today were manufactured from PVC rubber and generally utilised within the rubber industry for the transportation of Carbon Black to be used as a reinforcing agent in a variety of rubber products. By the 1960s development of polypropylene, combined with advances in weaving, the bigbags as we know it today came into being and was rapidly adopted by a wide variety of oil and chemical companies to store and transport powdered and granular products. It was during the oil crisis of the 1970s that the FIBC really came into its own for transporting huge quantities of cement to the Middle East from across Europe for the rapid expansion of the oil producing countries. At its zenith, upwards of 50,000 metric tons of cement was being shipped out on a weekly basis to feed the vast building programmed. The modern FIBC transports a growing figure of over ¼ billion tonnes of product each year and is used to handle, store and move products as varied as cereals to powdered chemicals and flour to animal feeds. With a capacity of up to 3m³ and load capability ranging from ½ a tonne to two tonnes FIBCs are highly cost effective, easily recyclable and ideal for virtually any free-flowing granule, powder, pellet or flake.